Deb from Faith Hope and Fighting Spirit is my Guest writer today. Like many of us she suffered with Meniere’s for several years before she was diagnosed. Deb is a teacher in Barrie, Ontario, Canada (1 hour north of Toronto). This is the story of her trials with the treatments she has tried, and what is working for her. Here is the readers digest story of my fight with Meniere’s. I have found the Meniett Device extremely helpful as a treatment, albeit, not a cure. I have tried various treatments over the years, but so far this treatment seems to work the best for me. It is difficult to track exactly when Meniere’s first hit me but it was likely December 2001. For 7 years I had attacks but I didn’t know what was wrong with me. Doctors thought they were vertigo migraines. It was not until 2008 that I was diagnosed with Meniere’s Disease and my Oto/ENT prescribed a low sodium diet and Serc. For over a year this helped but by the spring of 2010 I became very sick and began to miss work for weeks at a time. I am a teacher and in the fall of 2010 after a long hot summer I could not return to work. I couldn’t walk. I couldn’t even get dressed by myself or go to the washroom alone. I was desperate. I know I was depressed. My Oto/ENT just kept giving me more and more Serc that wasn’t doing anything so I tried everything. At one point I was seeing my Oto/ENT, my family doctor, a chiropractor, a natural path, an acupuncturist, a massage therapist and an osteopath! I needed a secretary to keep me straight with my appointments. I was then given the opportunity through my Oto/ENT to be fitted with a ventilation tube so I could try a Meniett device. 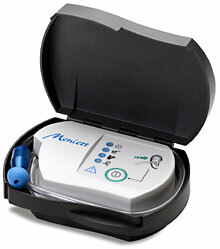 I had read about the device and wanted to try it, even though I wasn’t sure my insurance would cover the $3500.00 cost! This was on September 20th, I was not well enough to go back to school so what a Godsend this Meniett was! Miracles happen daily and I have been fortunate enough to be part of one. God heals in all sorts of ways and with me He chose the Meniett! After using the machine just 5 days I was well enough to run again! I had missed this desperately. Three weeks after that on October 12th I was able to return to school. I was so happy to see my students and to lead a “normal” life. I hope I remember this feeling always. Illness really can be a blessing, especially when you can be so thankful for the healing in the end. Since then I have used the machine 3-4 times a day. Each session takes about 5-7 minutes and it is small enough that I just carry it to work with me and use it on my lunch. My original tube was blocked recently but my Oto/ENT replaced it with a larger one that should last me 18 months. The procedure for getting the tube inserted takes about 5-10 minutes and is not that painful. My doctor just used a local anesthetic that burned a bit when it was put on but that’s it. The premise behind how it works is that the air puts pressure into the inner ear which then moves the excess endolymphatic fluid to the endolymphatic sac. They will usually give you a 60 day trial period. If it doesn’t work for you, just send it back and they will not charge your credit card. I am not entirely drug free. I still use meclizine periodically and I take Ativan at night if I am feeling extra stressed or I can feel the spins lurking in the back of my head. The really good news is that after a good fight with my insurance company it looks like they will finally pick up the cost! I hope this helps. I wish all of you good health and strength to continue the good fight! **Please note that I (Wendy) have added links the treatments that Deb tried. The links will lead you to sites that I found explaining the premise behind these treatments, or to definitions of the terms. As always remember that different treatments work for different people. We are not doctors and we aren’t telling anyone what they should do. This series is to allow people with Meniere’s to see how others have dealt with this disease. To keep up with Deb’s progress please check out her blog Faith, Hope, and Fighting Spirit. It´s good to hear about the help you have from using the Meniette! I am sorry that the meniett didn’t work for you. Its so odd that so many of us have similar symptoms yet vary so much in our treatments. I pray that you feel better. Your post was inspiring to read…..you have been through so much yet still continue to be optimistic! Have Menieres since Nov 2012 Not allowed to drive, just wandering if I will ever be able to work or drive again. Lost hearing in right ear, constant ringing. Have verigo attacks approx once a month. Good days and bad days. Stores are the worst, brain overload. Rely on my cane in public places. Best word to describe alll of this is Trapped!! That’s very fast progression for Meniere’s. It usually takes much longer to get to that point. I can’t say if you will ever be able to work again. Do you have a Otolaryngologist or Otologist who specializes in Vestibular problems? Have you had vestibular testing? There are many treatments that help different people, I wouldn’t give up until I tried them all. I am a very advanced case. The Endolymphatic Enhancement Surgery helped with my vertigo. But I do not drive. I have severe disequilibrium. But I also have migraines with vertigo, so I have vertigo caused by different things. (they feel different so I know which way is which). You are commenting on a post from a guest who uses a Meniette device. Have you heard of it or considered it. Are you unilateral? Bilateral is rare and doesn’t usually hit so soon. If you are unilateral there are many things they can do. Gentimiacin (I think I spelled that wrong) injections, steroid injections….. The tinnitus should fluctuate, but it’s probably there to stay, however, not every day is as severe as others. You may notice your tinnitus gets much worse right before a vertigo attack. Have you had an MRI, everyone with Meniere’s symptoms should to rule out other things. don’t give up yet. My advice, make sure you have a vestibular specialist. See a therapist who can help you deal with your life changes. Be open to trying different therapies. I had bad Meniere’s symptoms for a while then went in remission for about 4 years. So there is always hope, but if it is Meniere’s it is progressive, so life changes. Things may not be what you expected, but you don’t have to be trapped all the time. I’m sorry I haven’t replied sooner. I too can no longer have MRI’s because of my Cochlear Implants, I keep wondering how that will change things for me in the future. Your diagnosis still sounds up in the air. Most of us with Meniere’s are on a diuretic, I’m on one now because of my Idiopathic Intracranial Hypertension, not because of Meniere’s. They really didn’t do much for me, lowering my salt intake didn’t seem to help much until I got a meal with a lot of salt…ewww. So reducing my salt helped more than the pills. I’ve heard others say neither helped. I’ve never been on Serc, but know some who have. As most things, it seems to work for some and not for others. I gather no one has done vestibular testing? They can show if it’s some other vestibular disorder…and stuff like that. I take Valium and Phenergan at the start of an attack, and it helps. Showering and bathing are some of the biggest triggers I have. The movement of the water and the change of temperature on my head…I have an extreme phobia of it, but I have to over come it..I need to work on that a bit more. : ) (no I’m not a stinky person, but my skin is so dry when I do get a real bath my skin just peels off…ick)…yes too much information. You may want to check out http://vestibular.org/ I found it helpful when I was looking for answers. Please feel free to reach out. I’m here. I may take a little while to get back to you, depends on how I’m doing, but I’m here and you will find you are not alone. Good luck…and as you said, one day at a time.